To help make it easier for you to convert your currency, we have created four specific datasets that bring in the up-to-date conversion rates for AUD, EUR, GBP, and USD. If you have a currency type column that specifies the currency being used in the report (e.g., USD, EUR, etc. 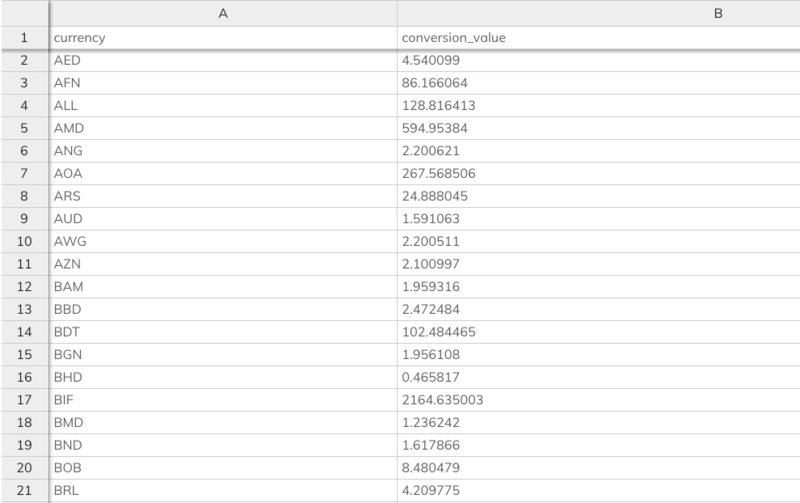 ), then bring in the dataset that shows the conversion rates for your desired currency. Next, add a Joined Report and add the report with your data as "Connection 1" and the dataset as "Connection 2." 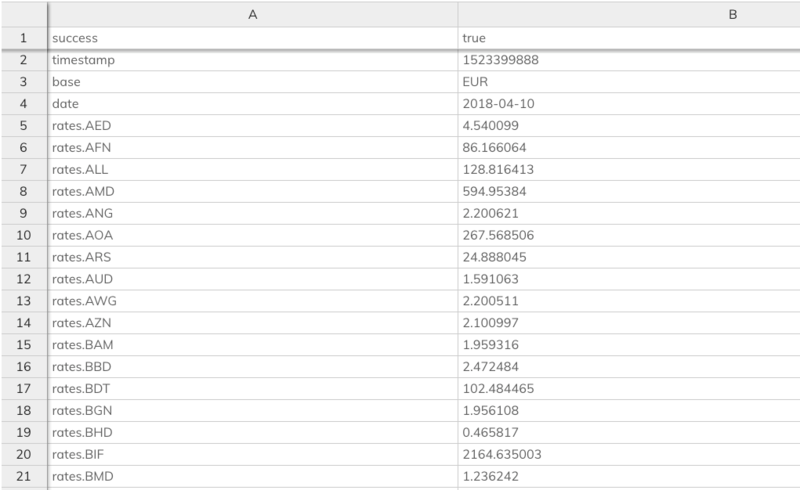 Make sure to select the column that has the type of currency (e.g., USD) as the common value for Connection 1 and "Currency Code" for the common value in Connection 2. After you've made the joined report, add a Calculated Column transform to multiply the currency value with the currency rate ("Currency Rate per ___") to get the converted value for the desired currency. If you would like your currency converted into something other than AUD, EUR, GBP, or USD, here's a way to convert them in real time on your metrics. 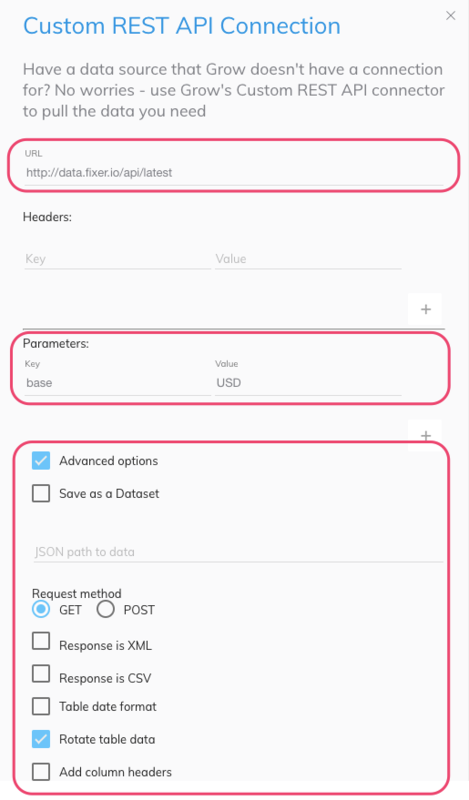 In your metric, add a new report and select Custom Rest API for the data source. Check the Advanced options box, and make sure the Request method is set to GET. You will also want to check the Rotate table data checkbox. Then, by using a substring, we can extract the date line and column A to just the three-letter currency code. This will allow Grow to match up the currency conversion in this report with the currencies in your original report. To finish this out, go ahead and use a Joined Report to join the two and display the converted currencies with your original data. What if you want to be able to see a currency conversion for the last month or the last year? This does have a couple of limitations. First, you will not be able to make the date ranges dynamic. This means that you will have to set the dates to a specific range (i.e. June 1, 2017 to May 31, 2018). Second, fixer.io limits the historical data to 12 months back from the end date. So if I set the end date to April 30 of this year, I could pull data up to May 1st of last year, regardless of today’s date. To connect to historical rate data, first log in to your Grow account and add a new metric or add a new report inside of another metric. Select Custom REST API Connection as the data source. After you’ve entered the headers, you’ll enter the parameters. To add multiple parameters, press the white plus button. This value is the three-letter currency symbol that your data is in. This value is the three-letter currency symbol that you are converting your data into. The end date is the most recent date for which you want the currency conversion. The start date is when you want to begin pulling the currency conversions back. Once you have done all of this, you can press the blue Connect button. This will return the exchange rate between those currencies, with each column representing one day within that date range.